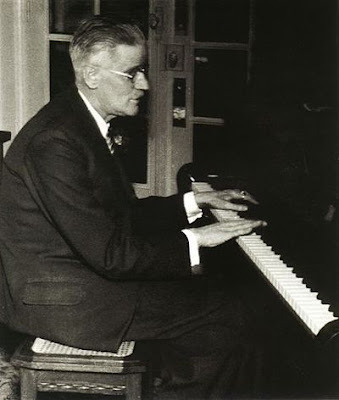 A photograph of James Joyce at the piano, 1939, by Gisèle Freund. ‘Chamber Music, which appeared originally in 1907, was the first of Joyce’s books to reach the public. Though it brought him no royalties, it was to gain him a place in the Imagist Anthology. It was thus to associate him with the Anglo-American group that included Eliot and Pound, who later helped to publicize his books. Elusive and formal, these poems are, above all, musical. Joyce, who trained as a singer in Paris, set out to write lyrics that could be sung, and their imagery—characteristically—appeals chiefly to the ear. Echoes from books, together with images from musical instruments, contribute to Joyce’s “elegant and antique phrase.” His models are the Elizabethan lyricists, the airs of Dowland and the words of Shakespeare. -from the ‘Publisher’s Note’ in Jonathan Cape’s 1985 edition of Chamber Music.